THEMIS was originally a constellation of five NASA satellites to study energy releases from Earth’s magnetosphere known as substorms. On May 19, 2008 the Space Sciences Laboratory (SSL) at Berkeley announced NASA has officially approved the movement of THEMIS B and THEMIS C into Lunar orbit under the mission name ARTEMIS (Acceleration, Reconnection, Turbulence and Electrodynamics of the Moon’s Interaction with the Sun). So the ARTEMIS mission retasked two probes from the 5-spacecraft Heliophysics constellation THEMIS to study the interaction of the Moon with the space plasma environment. The two ARTEMIS spacecraft have now been in elliptical equatorial orbits around the Moon since mid-2011, and continue to operate flawlessly. Both probes are in very stable orbits, and the health of all instruments and the spacecraft remains very good. 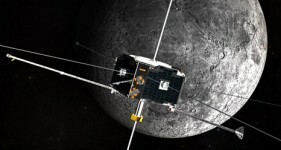 With the LADEE mission about to enter its nominal science orbit, and LRO placing new emphasis on its own measurements of the lunar exosphere, ARTEMIS plays a key role by providing measurements of the solar and terrestrial plasma that acts as both a source and sink for the lunar exosphere, and that will affect any dust released from the surface. Together, these three missions will team to measure the inputs, dynamics, and outputs of the coupled system formed by the Moon’s surface, its dusty exosphere, and the space environment. All ARTEMIS data is publicly available on a few-day time scale, and we welcome participation from the community. More information on the mission, instrumentation, data (including summary plots), software, etc. is available from http://artemis.ssl.berkeley.edu, or by contacting the team directly.